Brad Long is a renowned Canadian chef who advocates ethical, local, organic and sustainable practices. His newest cookbook, Brad Long on Butter (it’s good for you), is the first in the new Chefs to Readers cookbook series; these books work to create a deeper connection between professional Canadian chefs, and home cooks trying to eat the best they can. Brad Long on Butter is an absolute delight to read. It’s light, conversational tone feels almost like a dialogue with Chef Long, rather than an educational tome. I usually skim intros, to get a sense of the author and topic. Not here. Here I read Long’s intro with the same focus and intensity I’d have were I reading a novel or intriguing article. The recipes are set up as narratives rather than the typical ingredients + directions. Long injects his book with humour, which not only makes each recipe approachable, but also makes it sound like buerre bland is actually doable. Hands down, this is one of the best cookbook reads (for me) since I started making my way through 50 Shades of Chicken (that’s a good one too). 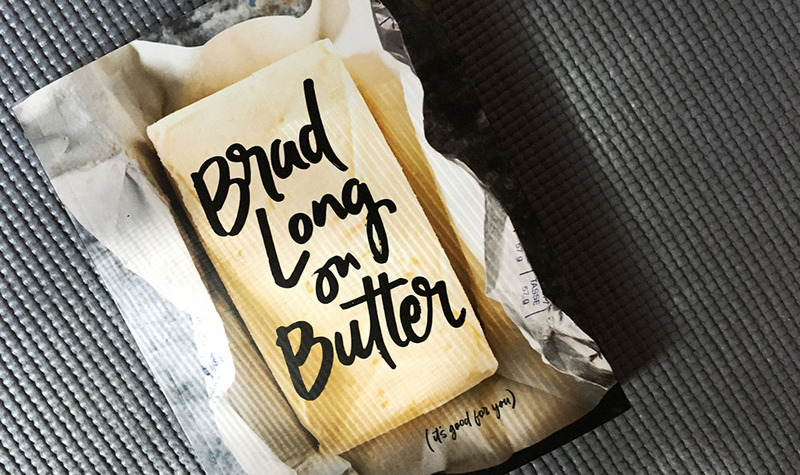 Avid bookworms will find the kitchen a welcome and entertaining place with Brad Long on Butter. Making the recipes involves a bit of interpretation, as the directions are punctuated with anecdotes and humour. Luckily, it isn’t boring and once you get the hang of following the directions, everything falls into place quite nicely. I started with the chocolate chunk cookie recipe. It was easy to follow and make (because it was so familiar). The cookies turned out great and were absolutely delicious. Labeled as an “ode to butter”, this cookbook is definitely that and more. It’s a tool to experience butter in ways you never imagined… and have a good chuckle or two in the process.